Terminology The term “hind gut ulcer” is often used to refer to any of the following three conditions: hind gut ulceration, hind gut inflammation or hind gut stasis. All three conditions often present very similar, although not identical symptoms, therefore making it difficult to supply a definitive diagnosis. Additionally, horses with hind gut stasis or only mild hind gut inflammation may present with such mild symptoms that their condition goes unnoticed by an untrained or inexperienced observer. Horses that present with definitive hind gut ulceration are already suffering so much that their overall health, attitude and performance are significantly affected. It should be our goal to identify horses that present with the beginning stages of hind gut stasis or hind gut inflammation and prevent them from reaching severe inflammation or ulceration. When the statistic 70% is used to describe the incidence of hind gut ulcers in race horses, this number represents horses presenting with hind gut ulceration, hind gut inflammation or hind gut stasis. The percentage of race horses with true hind gut ulceration is decidedly less, but the actual number is unknown due to the limitations related to obtaining a definitive diagnosis for hind gut ulceration versus hind gut inflammation or hind gut stasis. 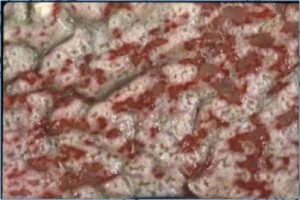 Unfortunately, there is no non-invasive technique that will provide a positive diagnosis of hind gut ulcers in a live horse. Hind Gut Ulcers: Hind gut ulcers are characterized by sloughing of intestinal epithelial cells and erosion of epithelial cells and mucosa in the ceacum and/or colon as illustrated in Figure 1. This condition is also accompanied by thickening of the intestinal mucosa as illustrated in Table 1. Figure 1. Ulceration of right dorsal colon. Hind Gut Inflammation: Hind gut inflammation is characterized by sloughing of intestinal epithelial cells and slight-to-moderate thickening of intestinal mucosa. 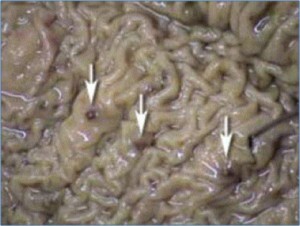 Intestinal inflammation may also be accompanied by slight ulceration as illustrated in Figure 2. Figure 2. Inflammation and minor ulceration of right dorsal colon. 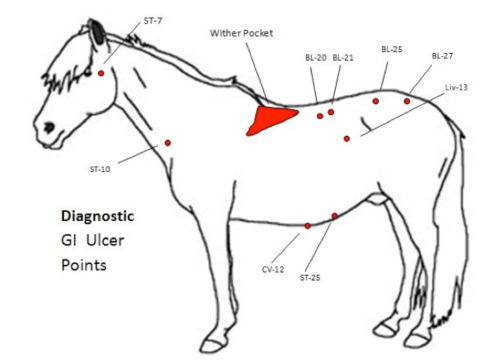 A final diagnosis of hind gut ulceration, inflammation or stasis combines the general observations listed above with laboratory blood results, response to acupuncture points and ultrasound. Very few, if any horses will exhibit all the symptoms listed above. Therefore, horses that exhibit several of the symptoms listed above should be considered suspicious for hind gut health problems and treated according to the severity of symptoms. It is important to remember that horses can have gastric ulcers with no hind gut involvement, or they can have hind gut health problems without gastric ulcers, or they can have gastric ulcers and hind gut health problems concurrently. Many times practitioners must use their best judgment when deciding on treatment options and then modify treatment based on responsiveness of the horse. The following graph illustrates survey data from a gastric and colonic ulcer study in the United States. It should also be noted that there can be significant variation in the incidence of ulcers between trainers. These differences not only reflect differences in feeding practices, but also reflect differences in horse handling practices, training schedules and turn out schedules. Horses fed large amounts of grain (greater than 6-7 kg per day), that receive very little or no turnout, are handled in a rough manner and trained intensely will exhibit a higher incidence of ulcers compared to horses receiving less grain, more moderate training and more effective handling. However, all horses in training are predisposed to gastrointestinal problems. All trainers have horses with either gastric and/or colonic ulcers. It is just a question of how many of their horses have ulcers and how severe the ulcer problem is. Hind gut health problems involve inflammation of intestinal mucosa, reduced immunity of intestinal epithelial cells, and/or unbalanced fermentation. Therefore, the nutritional approach to correcting these problems involves providing anti-inflammatory properties for intestinal mucosa, improving the immune response of epithelial cells and probiotic and prebiotic cultures to re-establish balanced fermentation. EquiVision’s 21-Day Hind Gut Health Program has proven effective at restoring normal function of the large intestine. The program consists of EquiVision’s Fish Oil Factor to provide anti-inflammatory activity from eicosapentaenoic acid (EPA) found only in fish oil and EquiVision’s ADR, which provides components to normalize the immune system of the intestine, along with probiotics and prebiotics to re-establish active and healthy fermentation. The probiotic cultures in ADR were selected to facilitate the proliferation of beneficial bacteria in the horse’s intestine and can be considered conductor’s of the fermentative symphony. As such, they not only perform a beneficial function themselves by helping to establish healthy pH levels, they also support the proliferation of other beneficial bacteria that produce energy substrates and contribute to healthy intestinal mucosa cells and healthy energy metabolism. A beet pulp-based feed such as Triple Crown Senior is recommended for horses with hind gut health problems since beet pulp encourages the production of organic acids in the large intestine that promote the growth of intestinal villi. Villi are necessary for nutrient absorption and normal immune function of the intestine. 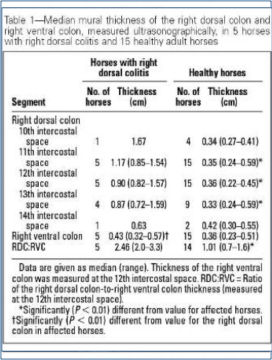 Finally, keep in mind that hind gut health may determine the overall health of the horse. Support for hind gut health should be provided as soon as you think it may be needed. It is much easier to correct a static or slightly inflamed intestine than it is to treat an ulcerated intestine or colitis.